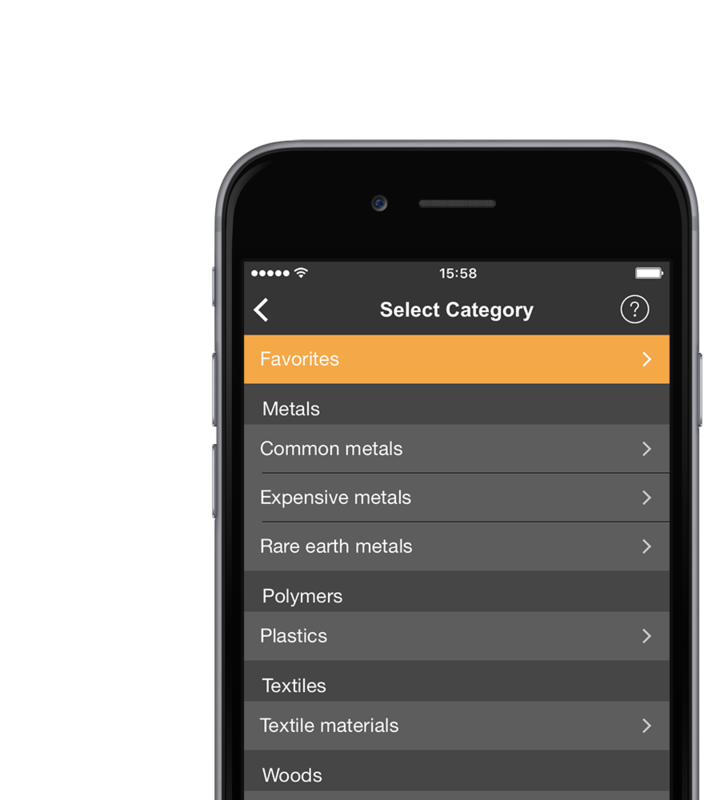 Idemat is a sustainability inspired materials selection app, empowering designers to create more sustainable products. is too time consuming or lack the necessary support and inspiration to perform the task ahead. The Idemat app provides the solution and brings life cycle assessment closer to the start of the design process – an area where more significant environmental gains can be realized. 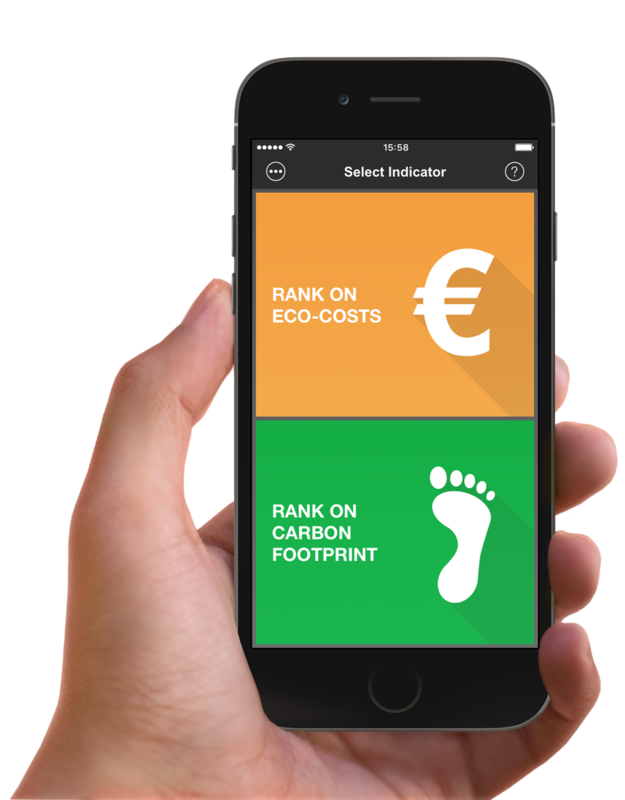 Idemat features two impact indicators to express environmental burden: eco-costs – developed by Delft University of Technology – and carbon footprint. Choosing either one allows for the selection of one of three scenarios, which are explained in detail in the app. What happens with a material near the end of its life can have a significant contribution regarding its environmental impact. By integrating these so called end-of-life scenarios at the start of the selection process, a complex and error prone step is greatly simplified. A coherent categorization of entries allows for easy navigation and comparison. To compare entries from different categories a favorite list can be created. The over 700 unique LCI’s relate to categories such as metals and plastics, woods and textiles up to electronics, transport, derived processes and many more. Entries within a category are visually represented as bars, sorted by score or alphabet whichever personal preference dictates. Scores directly correspond to bar size, a larger bar indicating a larger environmental impact as compared to a smaller bar indicating a less significant impact. The bar’s primary color relates to the chosen indicator, whereas its shade communicates the chosen end-of-life scenario. The end-of-life contribution on the score (if applicable) is visualized as shown in the animation below. Each entry-represented bar has its own detail screen featuring inspiring imagery and in-depth information. The eco-costs indicator is broken down in its individual components, inspiring and challenging designers further to reduce impact in these specific areas while also providing maximum transparency. Besides this, an overview is given of how each end-of-life scenario impacts the score of both indicators. The detail screen also provides web links to relevant additional information and allows for entries to be added to a favorite list. An identifier ID added to the bottom of the screen corresponds to the full IDEMAT database, allowing for quick reference and further rigorous LCA calculations. Click here for instruction video 1. The IdematLightLCA app features an extra option: making a simple LCA calculation according to the Fast Track method, using the data and the selection method of the Idemat app. You can open an LCA, and add materials and processes to it with the required quantities. You can even calculate the eco-costs of products with an Environmental Declaration. Click here for instruction video 2.